At the heart of the new Sony NEX-3N is a large 16.1 million pixel Exmor APS-C HD CMOS sensor, which is the same device already featured in the top-selling Sony NEX-5R. Despite its light and small body, the Sony NEX-3N still manages to include a bright 7.5cm (3-inch) LCD screen, which is capable of flipping up to 180 degrees, which is especially useful for shooting self-portraits. The compact system camera also includes a built-in flash. For the first time in a Sony NEX camera, a zoom lever is found around the shutter release button, for easy composition, especially when shooting with the screen at awkward angles, or when recording video. Auto Object Framing is included in this camera, which is also found on the new Sony Alpha a58. This is basically a continuation of the innovative Auto Portrait Framing, which made its debut last year, and sees the camera assessing the scene in front of it and cropping captured images automatically for a better composition. Weighing in at just 210g (7.4oz), the Sony NEX-3N is the world's smallest and lightest interchangeable lens camera to feature an APS-C sensor. That's quite a mouthful, but basically it boils down to the CSC being sleeker than others from Canon, Samsung and Fuji. The camera's other features include a sensitivity run between ISO 100 and ISO 16000. Sony says that the Bionz processor has been improved to facilitate the same area-specific noise reduction technology that has already been viewed on the Sony a99 full-frame Alpha camera. Expected to be available from the middle of March, the Sony NEX-3N price will be around £400 (around US$617/AU$596) with the standard 16-50mm power zoom lens bundle. A twin kit, which will also include the 55-210mm lens, will be available for around £600 (around US$926/AU$894). 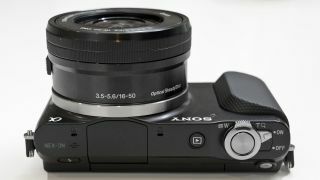 Read our hands on: Sony NEX-3N review for more information.